Work to improve safety for road users on the M6 between junctions 14 and 15 in Staffordshire will start on Monday (10 March). The Highways Agency is to replace central reservation barriers and bridge parapets which sit in the central reservation on the northbound section and act as edge protection to the bridge deck. 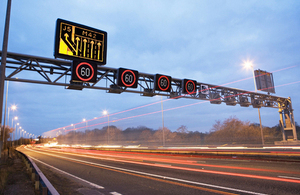 During the four-week scheme there will be a 50mph speed limit, narrowed lanes and the hard shoulder will be used as a traffic lane during the day time. There will be four overnight carriageway closures, two in each direction and not at the same time, from 10pm to 6am. This work will significantly increase safety for users of this section of the M6 by improving sub-standard central reserve barriers and parapets. Work will be carried out when traffic flows are lighter but drivers should still allow extra time for their journeys. The northbound carriageway will be closed from 10pm on 15 March until 6am on 16 March, and from 10pm on 15 April until 6am on 16 April. The southbound carriageway will be closed from 10pm on 16 March until 6am on 17 March, and from 10pm on 16 April until 6am on 17 April. When the northbound carriageway is closed, traffic travelling north will be diverted at junction 14 and directed along the A14 Stone/Stafford Road through Stone and Trentham, then the A500, rejoining the M6 at junction 15. When the southbound carriageway is closed, traffic will be diverted along the same route, but in the opposite direction.